Listen to a high-octane grime and club mix from one of London’s best new selectors. A.G's M'n'M show on NTS Radio is one of the U.K.'s best showcases of what's new in grime, and the reason The FADER celebrated her in 2016 as one of "seven women pushing grime forward." The east London native got her training in mixing on the pirate radio airwaves of the capital city, and now hosts the unmissable MnM every other Thursday, as well as the occasional sweaty club night .G Style. 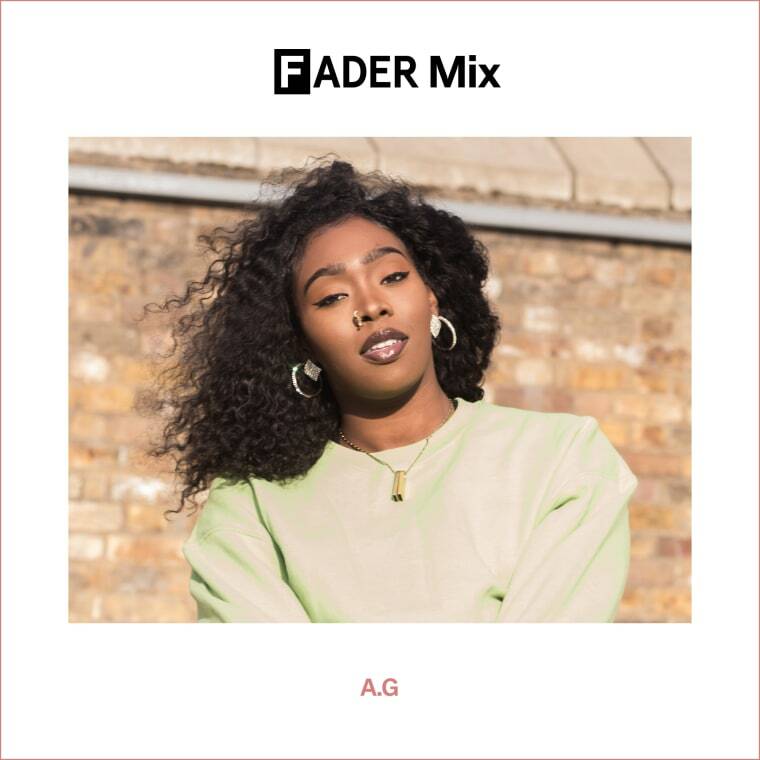 In her new mix for The FADER, the masterful A.G uses three decks to blend the most lethal grime instrumentals with experimental club workouts and snippets of all your favorite hip-hop and R&B bangers. Listen below, and scroll on to read more about the London trailblazer. I’m currently at the NTS office, sun coming in through the windows, everyone in here has a nice hairstyle. I’ve just finished recording the mix and I’m looking at Manara eating a cheese and onion Greggs pasty. Well it’s a three-deck mix, mostly grime with a lot of other club genres woven throughout. I listen to my fave mixes and radio shows when I'm in the shower and getting ready to go out so I’d want people to do that. Sticking pieces of masking tape on the radio dial to flick through all the best radio stations quickly. My big sister is a genius for that idea. I got into DJing through radio; I was just selecting at the time, but the station had a webcam and chatroom and everyone would pressure me to mix so I started to learn. What’s your favorite music video of all time? Off the top of my head it’s either Missy Elliot, "The Rain" or So Solid Crew, "They Don’t Know." Or maybe So Solid Crew, "Oh No (Sentimental Things)." So Solid videos were way ahead of their time. What's your 2017 song of the summer and why? Kendrick Lamar f. Rihanna, "Loyalty," 'cause it sounds like winter and the video makes me smile. Any exciting projects or events coming up you want us to know about? I’m joining forces with BBC AZN Network on August 27 and we’re combining our raves and doing a Bank Holiday .G STYLE v CALLER TUNE at The Yard Theatre. We have Girl Unit, Amz, and Rico Mars on the lineup so it’s due to be sick! After that, I get to go to the motherland for the first time and DJ at Nyege Nyege Festival in Uganda, which I’m super excited about as it’ll be my first time in Africa. And finally, what's the last book you read that had a big impact on you, and why? The Name Of The Wind. I read a lot of fantasy and sci-fi books but that (and the second in the trilogy) was really refreshing and cute to read. I was in a good mood for a week. Pharoah, P Money, and Hyde, "Like Dem Man"
Donae'O f. JME and Dizzee Rascal, "Black"
DJ Q and Jammz, "Who's That Girl"
DJ Panic X Mvntana, "Rock Da Boat"
Sir Hiss, "Peace of Mind"